But that was not enough for many lawmakers, especially African-Americans who see Ms. Omar getting singled out as a woman of color, while Democratic leaders have let slide other racist and bigoted remarks — including those of President Trump. According to several people in the room, a number of African-American representatives stood up to challenge Ms. Pelosi. Representative Bonnie Watson Coleman, Democrat of New Jersey, defended Ms. Omar and said about the resolution, “I don’t think this is a good strategy,” according to one person in the room who took notes. 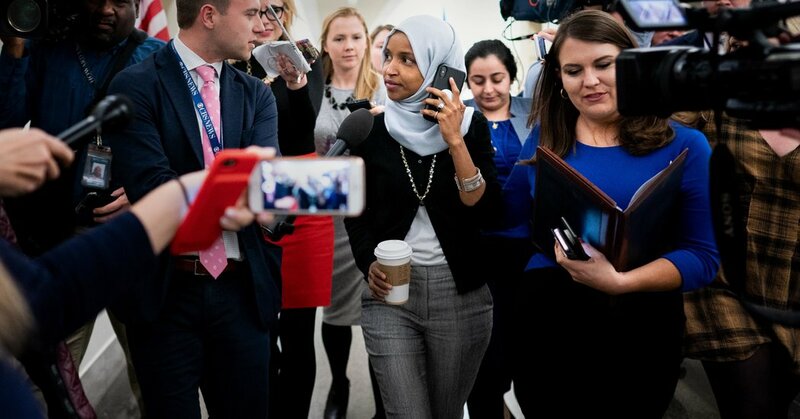 Ms. Pelosi said that the “picture painted of Ms. Omar is wrong,” but that the House needed to address the issue — and that the caucus was “a family” that needed to unite around its legislative agenda, this person said. Ms. Pelosi also told the lawmakers that the language of the resolution was still under discussion, and that no date had been set for a vote. Representative Jahana Hayes, a Connecticut Democrat who is black, told Ms. Pelosi that she had “put us in a bad position,” and complained that she had learned of the resolution by watching television. As Ms. Pelosi was responding, Ms. Hayes began digging around in her purse; Ms. Pelosi, thinking Ms. Hayes was talking to another lawmaker in the room, grew visibly irritated, according to a second person present. Toward the end of the meeting, the first person said, Representative Cedric L. Richmond, Democrat of Louisiana and another African-American, asked why leaders were pushing for a resolution condemning bigotry while ignoring other pressing matters, like the treatment of young black men by the police. And Representative Jan Schakowsky, Democrat of Illinois, who is white, made a plea for members to think twice before taking to social media to express controversial opinions, or risk dividing Democrats in a way that enables Republicans to exploit those divisions. “Can we not do this on Twitter?” she asked to laughter.